I just love finding ways to re-use and recycle. I also love containers, and finding new ways to keep organized. How adorable are these plastic baby food containers? They are such a perfect size, and be used for SO many things. For me, I have been wanting a way to keep all my girls’ hair things neat and organized. Because they have short hair, they mostly wear bows and flowers that are on clips, but we do have a collection of elastic hair bands, bobby pins, and other paraphernalia that needed their own place. These containers are exactly right! I had considered using a plastic tackle box, or bead box, that have different compartments, but decided against it for several reasons. First of all, I only use clear hair elastics, so I didn’t really need to organize them by color. I was also worried that if the box spilled for some reason, I wouldn’t just lose a few elastics, I would lose them all. 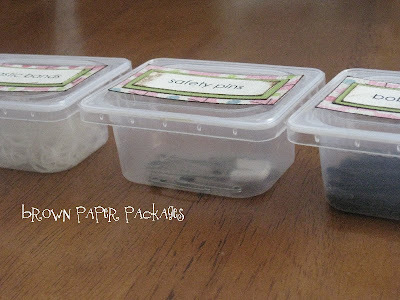 These containers fit in the small stackable Rubbermaid drawers I have in my bathroom cupboards, and also in the plastic bins I have on the shelves. YAY!! Print out desired labels on cardstock. Ink all edges. Tape words onto coordinating cardstock. Ink all edges. Tape matted words onto scrapbook paper. Ink all edges. 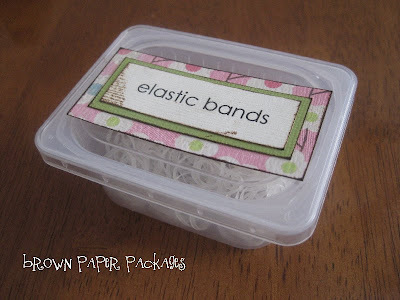 Tape onto the top of your plastic container. Portable First Aid kit: bandaids, alcohol pad, safety pins, etc. Perfect for diaper bag or purse! Store your extra Christmas bulbs, or other tiny Christmas or holiday items. 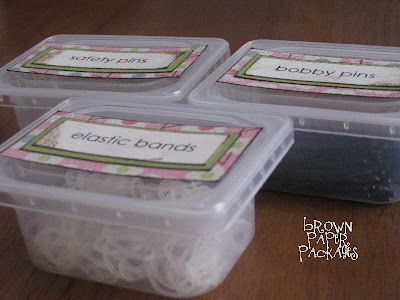 Desk storage: push pins, brads, paper clips, tacks, rubber bands, etc. Great for taking small items with you in your diaper bag or purse. 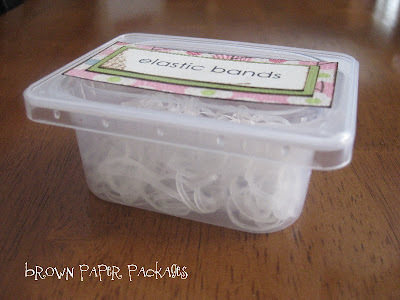 ***Reader tip…Perfect for storing tiny embellishments, brads, eyelets, etc. How fun to organize them by color, and then display! Thanks Jenn and Angela! 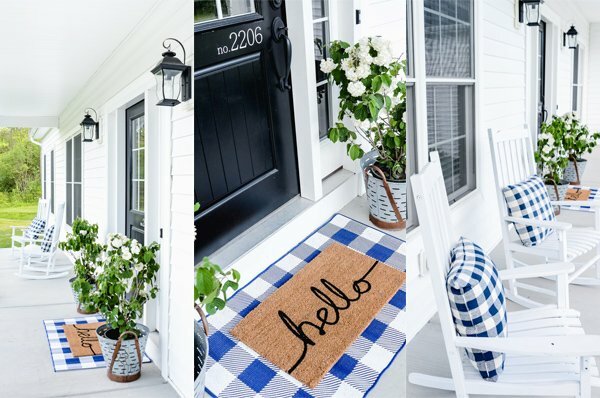 Very cute AND practical use for these! Could also be used in a utility drawer. I giggled when I seen your post. I threw a baby food container away tonite & thought I need to find a reason to save a couple of those to reuse. Perfect idea! I will be saving some for bobby pins & hair elastics. Thanks!! Perfect Ideas! I have ugly glass ones and maybe I could do the same thing. Although they wont be as cute. :) Thanks Kierste! Great idea! I have one eating baby food right now, so I will have to do that! Also, that would be great storage for little embellishments that I have! I love those little containers! I used them to store finger food snacks for my toddler in my purse so I had something on hand and the snacks didn't get smashed in the bottom of my bag. I love all your suggestions for them! Yes! I do this too. Now if only you can think of a good reason why I have been saving milk caps! lol Love it…. Kierste! Did you know that when Sam was a baby, I saved all of his baby food jars and created special labels for each to store all of my little eyelets and brads by color. I used to have them all displayed on a shelf. Now they are in a box, but I still love them. I also used formula cans to store fibers and stuff. I made cute gifts with the formula cans too. I am pretty sure our brains are some how linked together in this universe we live in. Thanks for the great idea! My sister usually just throws these out but I think I will have her save them for me to recycle into my craft station. I have this embellishment center on my wall http://www.michaels.com/online/product/DisplayEnlargedImage.jsp?imageName=sb0628.jpg and those small containers are the perfect size for all the little cubbies. That is a great idea! Too bad I don't have any babies. I'll have to ask my friends about their baby food containers though. So I found you by accident from clicking a link off of The Girl Creative. I'm glad I found you. I'm a follower. I love crafty and creative things. Have you by any chance seen the French Pinic blog? They have a great linky group for crafty blogs and I bet yours would fit right in! I hope you don't mind my loong post and will stop by to say hi! What a great idea! I love that!!!!! I CRAVE organization! I need some serious HELP! Thanks for the inspiration! I'm a follower now! I love this idea! And I really love how you use distressing ink in so many of your projects. I love the color brown you use. Can you tell me what you use? Which is the best distressing ink to you? Thanks! So smart! I've been wondering what I could do with them!!!! !